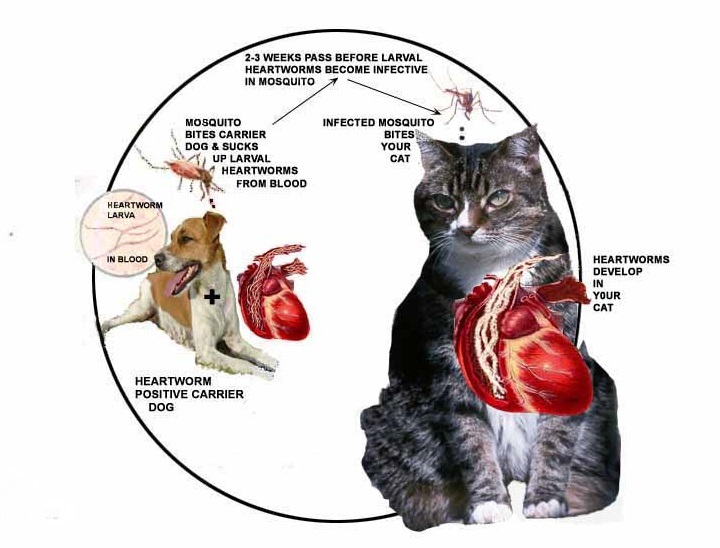 You simply must take this disease seriously; if you live in an area of world where heartworm disease is common, you need to protect your pet from this miserable disease ... prevention is easy... and have your veterinarian screen your pet on a regular basis. Cats are at risk too. 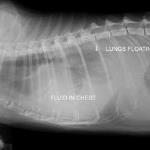 The incidence is cats is about 10% of dogs and the symptoms a little less severe... except for the sudden death part. In cats the common symptoms are fever, wheezing, coughing, breathing hard, and vomiting. "What To Expect When You Go To The Vet"
Cats: general information page and directory of diseases and problems specific to cats including vaccine recommendations, leukemia, feline viral infections, feline upper respiratory disease and cats that just aren't feeling well. Zoonotics: Diseases, worms, and parasites people get from pets. Enough about cats for a moment. This disease is a major cause of death... or at least a miserable life of hacking and coughing in a lot of dogs. Prevention is the key. And once again, if you live in an endemic area...which includes most of the United States... make sure you give your dog it's monthly heartworm preventive... or have your vet give the ProHeart 6 month injection. But we do a lot of shelter work at our clinic and we have several heartworm positive dogs a week that some very nice people are willing to rescue and adopt even though minimal treatment costs several hundred dollars. 1. Start on a preventative chosen by your vet. He or she may have you use this more often than once a month .... I like to recommend Revolution weekly for 2-3 times prior to treatment. This will not only prevent getting additional heartworms but will probably kill off a precentage of the weaker male heartworms and some of the larvae stages. This is good because then the body won't have to deal with such a big load of dying worms all at the same time when the more effective medication is given later. 2. Pre and post treatment with short term steroids and doxycycline or tetracycline. These medications will hopefully minimize the inflammatory and infectious reactions that take place when the parasites start dying and also kill the Wolbachia bacterium that heartworms release when they die. 3. Hospitalization for several days while administering 2 doses of the injectable medication (an expensive poison called immiticide) and monitoring for anaphylactic reactions, injection site reactions, and mild to severe shock. 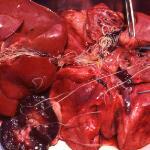 Both the poison and the dying heartworms can cause at least temporary damage to the liver, kidney, and lungs. 4. Post treatment monitoring, REST, continued steroid and antibiotic therapy for awhile, and a little luck. The treatment protocol above is what I use for most shelter patients for budget reasons. And the outcome is usually very successful. But it's NOT the best treatment protocol. 1. Do blood work and radiographs to check the health of the kidneys, liver, and heart before we challenge your dog not only with a fairly strong poisonous medication but also the challenge of absorbing multiple spaghetti sized dying worms in the lungs, heart, and blood stream. 3. 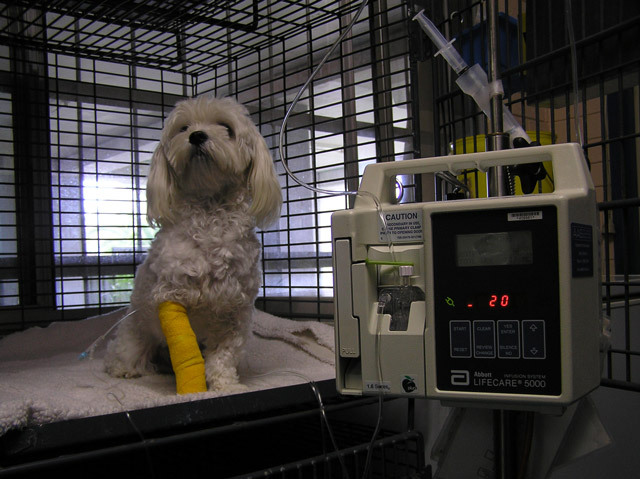 It would be better if your dog received IV fluids and other supportive therapy while metabolizing the immiticide and the toxins associated with dying heartworms. It will make the patient feel better, speed recovery, and just might prevent permanent damage to the lungs, kidneys, and liver. 4. It would be better if the post treatment monitoring also included repeat blood work and radiographs. So don't be surprised if you call multiple vets for a quote on treating heartworms to find the range of quoted fees quite broad. The low quotes are probably referring to minimal care and the the higher quotes probably include significant amounts of lab work, radiographs, IV fluids and other expensive co-treatment. 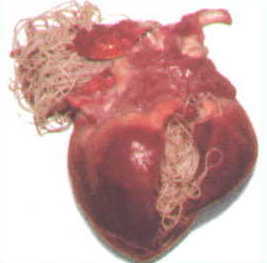 NOTE: In other countries, with Japan, I believe, being the first to introduce the technique, heartworms are being removed surgically using micro-invasion techniques through a catheter introduced through a vein! Luckily prevention is easy. 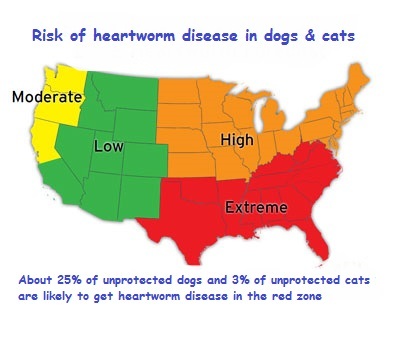 If you've been to a vet with a dog in the last 20 years and live in a heartworm endemic area, you already know about the importance of heartworm prevention in dogs. And you hopefully know that your cat is at risk too. Prevention of this disease is easy... there are quite a few products available, all of which work quite well... as long as you do your part and use them on schedule. Sentinel which does a superior job of killing intestinal worms and also helps keep flea populations low. Revolution: My favorite option for cats. Revolution is a monthly treatment....drops on the back of the neck...that does a good job of preventing heartworms but is also excellent for fleas, flea eggs & larvae, sarcoptic mange, and ear mites. And it does a fair job of controlling ticks. Like Revolution, Advantage Multi is applied to the back of the neck once a month. Trifexis: New in 2011. Chewable tablets. Near perfect flea control for 3-4 weeks. Excellent prevention and control of heartworms and intestinal worms. The only negative is that some dogs (not approved for cats) don't seem to like this chewable tablet and quite often upchuck it. Not too big a deal, but a nuisance. ProHeart Injection: This option is fairly new in the United States but has been used very successfully and safely in the rest of the world. It's also inexpensive and an excellent choice for those people who keep forgetting their monthly applications. It also does a good job at controlling intestinal worms... but not for the full 6 months. Cats get heartworm disease the same way dogs get it. By mosquitos biting an infected animal, then passing the infection on to other animals they bite. The big thing to know about this disease in cats is that the problem isn't as obvious as in dogs in that the symptoms are easily confused with other diseases. Cats may cough, wheeze, hack, and have labored breathing similar to heartworm disease in dogs, but the often just act sluggish, have weight loss, or vomit. And convulsions, sudden collapse, and even sudden death are much more common in cats than in dogs. 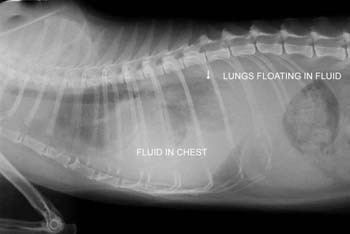 So don't be surprised if your vet recommends a heartworm test or chest radiograph if your cat demonstrates any of the above symptoms. Monthly prevention tablets flavored for cats are available but Revolution or Advantage Multi are much better choices, especially for outdoor cats. At present, there isn't an approved treatment for heartworm disease in cats. Your vet will recommend treatment of the symptoms and secondary problems and may or may not recommend risking an unimproved treatment in an attempt to kill the heartworms themselves. As always, a good deal of professional judgement is needed to balance the risks, health benefits, and costs for each individual case. One of the interesting things about heartworm disease in dogs is that while the heartworms are alive in your pet's body, they tend not to be recognized by your pet's immune system. 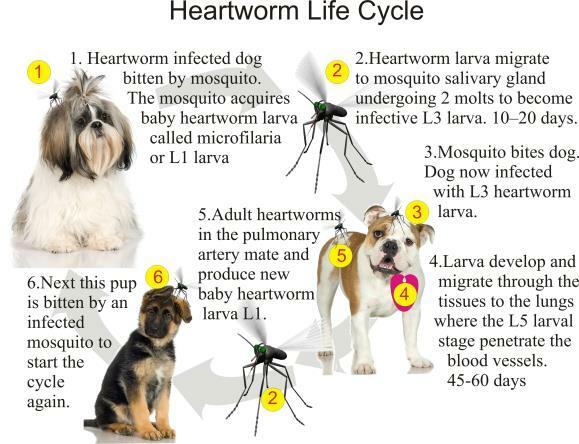 Many, if not most, heartworm positive pets in the early stages of the infestation act perfectly normal. The big trouble is likely to occur when the worms die and these little parasites only live 18-30 months. When they do die, all of a sudden the immune system recognizes all this foreign protein ...heartworms are fairly big... and goes into overdrive. This results in severe hacking, coughing up blood from badly inflamed lung tissue, possible heart attacks, fever, and severe inflammation of the liver and kidney as these organs try to metabolize and excrete the toxins and decomposing little parasite bodies floating around the blood stream. And that's not all. 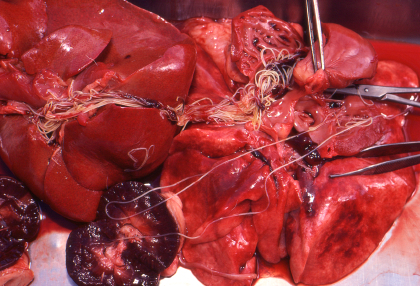 Upon death, heartworms release a deadly bacteria called Wolbachia into the blood stream. Yes, treatment is some potential dangers, but it usually works out well if in a hosptial environment under the treatment of a veterinarian. And it's certainly less risky than not treating.